A chain reaction crash this morning on the Pennsylvania Turnpike involved around 100 cars and tractor trailers over a several mile stretch, shutting down the turnpike for most of the day. The incident happened around 8:30 this morning in the eastbound lanes between Willow Grove and Bensalem, Pa. The westbound lanes were closed to allow access to emergency vehicles. 30 people were injured and transported to local hospitals, although none of the injuries were life-threatening. Motorists that weren't involved in the crash were stranded on the highway for hours due to the blocked roadway. Crews were able to remove sections of the concrete median so eastbound traffic could turn around. 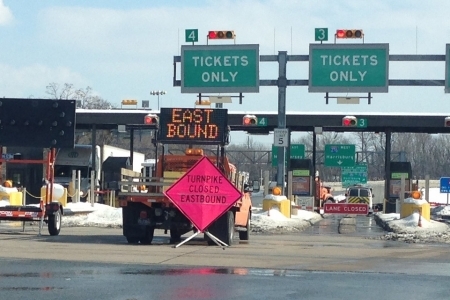 The turnpike was reopened at 4pm after a 7 ½ hour closure. The cause of the crash is still under investigation, but sun glare and ice may be a possibility. The School District of Philadelphia announced changes to it's school calendar today. Schools will now be open for three days previously set aside for spring break to make up for lost instructional days due to snow cancelations. Those days are April 15, 16 and 17. If schools are forced to close again in the coming weeks because of inclement weather then administration will review the calendar further. The Pennsylvania Department of Education requires 180 days of instruction or 990 hours for 7th through 12th grades, and 900 hours for kindergarten though 6th grade. If the instructional hours will be met, a waiver may be requested if the district is still short on days. A South Jersey Trio from Cinnaminson arrested last week in a string of armed liquor store holdups have been charged today with the robbery of additional stores. Elizabeth A. Albertson, 28, Charles Richards, 28, and Brian Hawthorne, 26, have been charged with the Jan. 14 holdup of a Sunoco gas station and the Jan. 21 holdup of a Country Farms convenience store. Albertson acted and the getaway driver whereas Richards and Hawthorne acted out the stickups. They group is believed to have committed 9 different robberies. They would use the money to buy heroin in Camden. Mostly Clear skies, temperatures falling through the 30's this evening in Center City.